MOSCOW, February 4. /TASS/. The Russian Foreign Ministry will request official comments from France’s authorities, as well as the French Embassy in Moscow concerning a media-cited statement by President Emmanuel Macron alleging that Russian media is meddling in the republic’s affairs with regards to the ‘yellow vests’ protests, Spokeswoman Maria Zakharova said on Monday. "If this piece of news cites everything correctly (and we will officially request the French side both in Moscow and in Paris about this), then President Macron is the main producer of fake news in France, and all his activity towards fighting this is a sham," Zakharova blogged on her Twitter account on Monday. The French press quoted Macron as saying that Russian media outlets were using their accounts on social network websites to intervene in the internal affairs of France. The diplomat refuted reports alleging that Russia’s RT and Sputnik were buying accounts on social networks. "The French side was repeatedly asked to substantiate these accusations. However, we have received nothing, because this is a lie," she wrote. 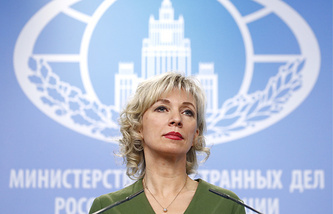 According to Zakharova, Russian media outlets often seek comments from participants in protest rallies, as the French authorities refuse to communicate with them. "He [Macron] must have forgotten that he himself is barring Russian journalists from his news conferences. So, journalists are interviewing not officials, but rather "idiots in yellow vests’, as Macron have called them," the Russian diplomat said. She also mentioned that the French media, for its part, rarely cites Russian officials. As an example, she pointed to France’s Le Figaro that failed to publish an interview with Russian Foreign Minister Sergey Lavrov.